I am so thankful to have received the Tartine Cookbook as a gift from Elaine. Every recipe that I have tried so far has turned out awesome. This lemon cream tart is no exception. It has the perfect balance of tartness and sweetness in the lemon cream. 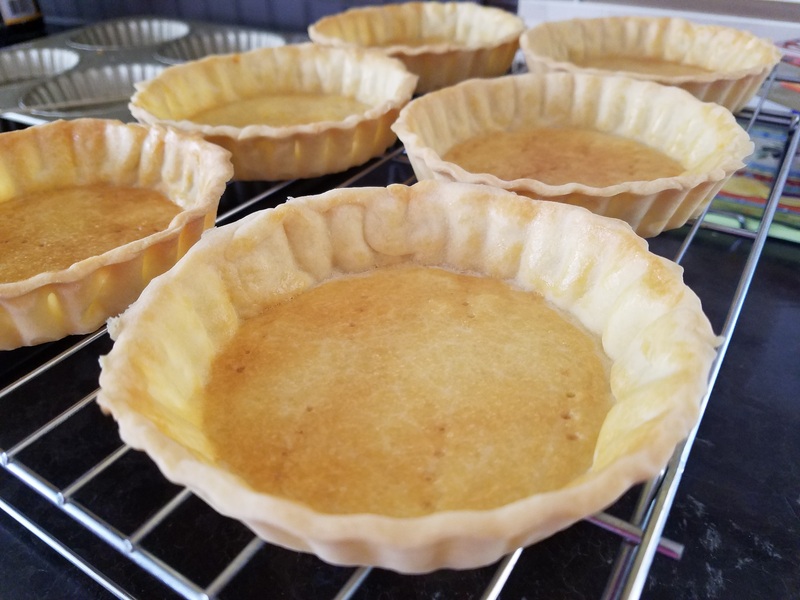 Following the original lemon cream recipe has allowed me to make only four tartlets. Five of us will be fighting for four tarts, that doesn’t work. I have doubled the lemon cream recipe here so that there is more than enough to fill six tartlets. 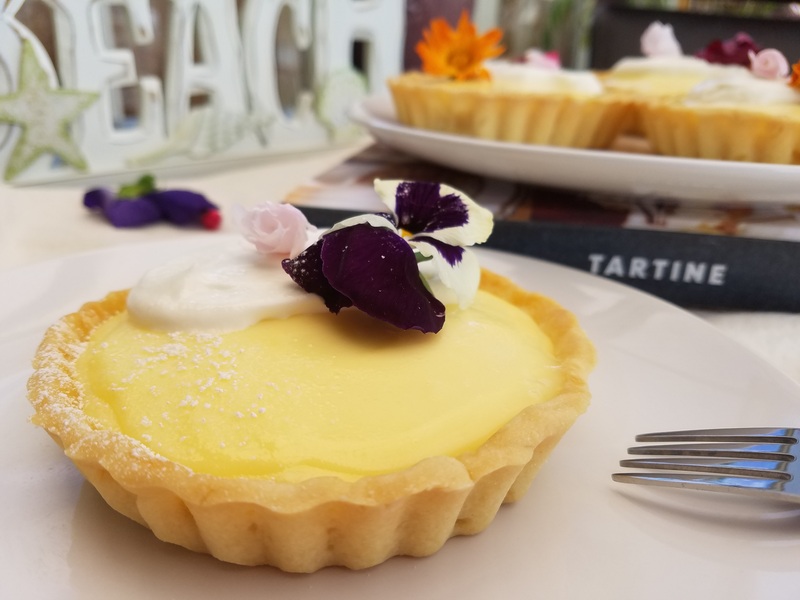 Thanks to Tartine for publishing the lemon cream tart recipe. 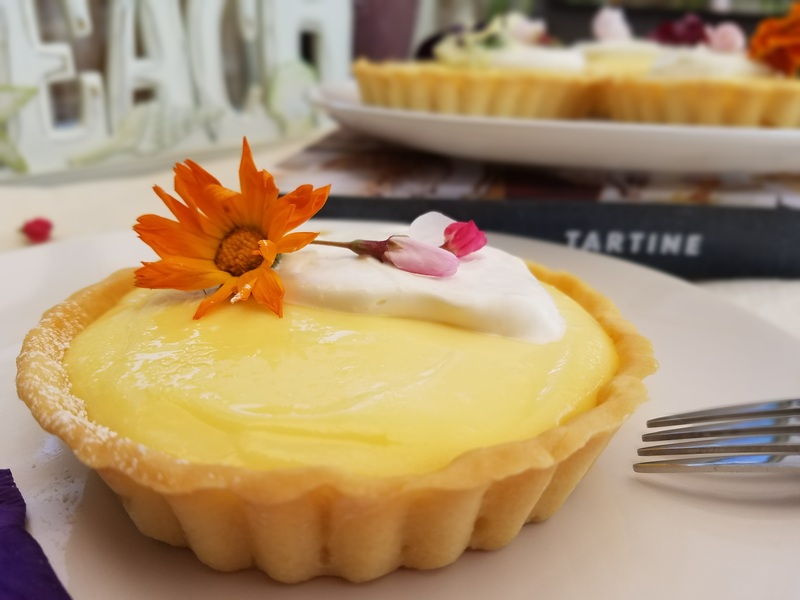 For those of us who do not live is San Francisco but willing to slog it out in the kitchen, at least we can try this wonderful tart at home. Combine butter, salt and sugar in a standing mixer fitted with the paddle attachment. Beat at medium speed until smooth. Mix in the eggs, one at a time. Mix until smooth at medium speed. Stop the mixer and scrap down the bowl with a rubber spatula. Add the flour all at once and mix at low speed until incorporated. Divide the dough into equal halves four times to make 16 dough balls. Shape each ball into a disc and flatten to 1/2 inch thick. Separated each disc with a plastic wrap. Wrap all discs and chill in the refrigerator for at least two hours or overnight. This recipe makes enough dough to line 16 4-in tartlets. Freeze the remaining dough that you do not plan to use. To line the tart pan, roll out each dough disc to just over 6 inches in diameter. I use a 6-in disc cutter and it works perfectly. Transfer each rolled-out disc over the tartlet mold and gently ease the dough into the mold. Press the dough against the side of the mold gently. Do not stretch the dough or it will shrink during baking. Dock the bottom of each tart shell with a fork to release the air during baking. Chill the lined tart pan in the refrigerator for at least 15 minutes. To bake, preheat oven to 325 degrees F. Transfer the tart pan to the oven and bake for 10 minutes until the shell starts to turn golden brown. In the meantime, prepare the egg wash.
Brush the bottom and side of each tart shell with the egg wash. Continue baking until golden brown. About 5 more minutes. Remove the baked tartlet shells and cool completely on a wire rack. Combine the lemon juice, egs, egg yolk, sugar, and salt in a glass bowl in a double-boiler. I use a glass bowl sitting over a sauce pan filled with enough boiling water such that the water do not touch the bottom of the glass bowl. Whisk the ingredients constantly while keeping the water on a slow boil. Continue whisking until the mixture becomes very thick and registers 180 degress F on the thermometer. It takes about 12 minutes. Remove the bowl from over the water and let it cool to 140 degrees F, stirring from time to time to release the heat. Meanwhile, cut the butter into 1-Tbsp pieces. When the cream is ready, use a immersion blender and add the butter one Tbsp at a time, blending after each addition until the butter is fully incorporated before adding the next piece. The cream will become pale yellow and thick. 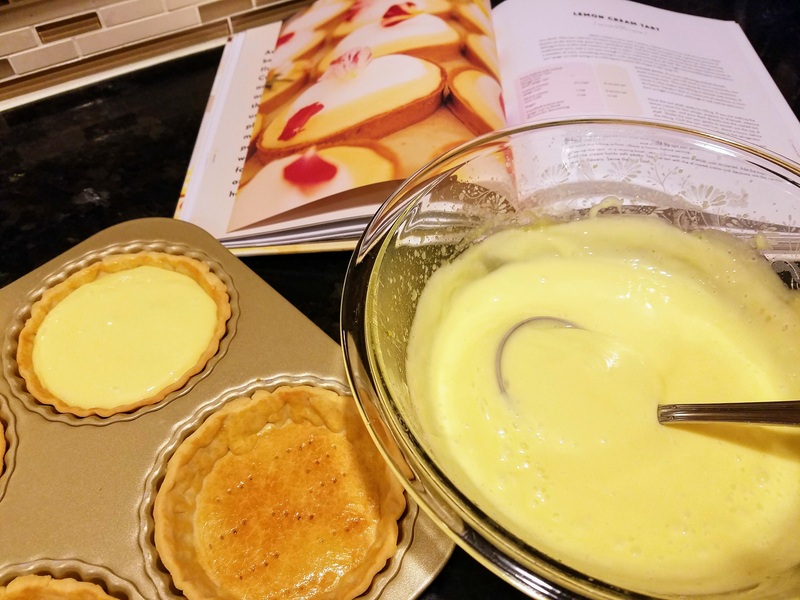 Reserve enough lemon cream to fill the tartlet shells. Refrigerate the remaining cream in a sealed container. You can serve the cream with scones or fresh fruits. Fill each tartlet shell with the cream and smooth the surface with a small spatula. Whip the cold heavy cream until soft peak forms. 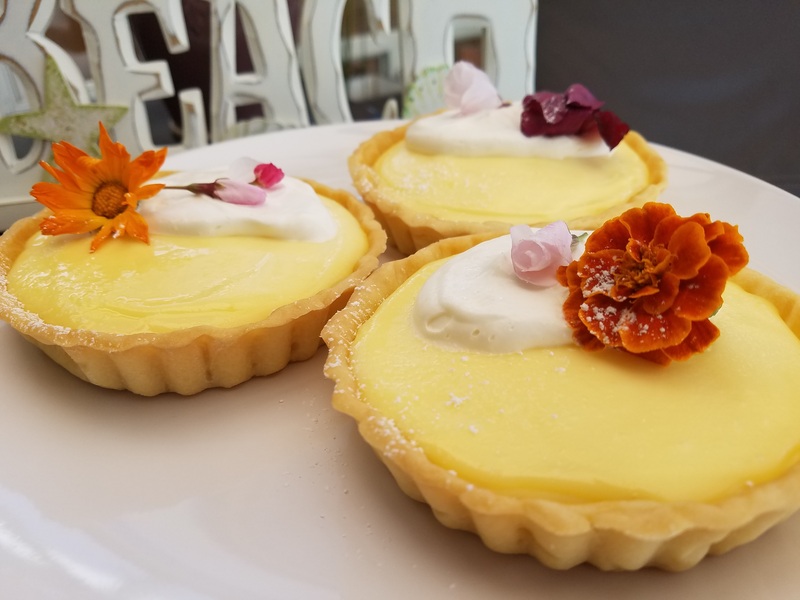 Top each lemon cream tartlet with some whipped cream and garnish with edible flowers. Dust with some powdered sugar if desired.